What is heavy? Is it something definite and invariable, a definite quality? No! As you are aware, heavy is only a comparative term describing one thing in relation to another, and, of course, your own reaction to the object being considered. What is heavy to one person is not heavy to another, and so on. You can easily grasp this simple fact without delving into Einstein’s Relativity. For instance, if you are dealing in a certain commodity averaging around five pounds in weight and you eventually come across a similar article weighing, say, eight pounds, you call that heavy – it is heavy compared with what you are accustomed to. If you are curling sixty pounds, you think of eighty pounds as heavy, yet by intensive training you are able to put up your curling poundage to one hundred pounds or more, at which point you would no longer think of eighty pounds as heavy. If you realize what I am driving at you will see that it is largely your mental attitude which determines your relative strength, as the muscle themselves have an almost unlimited capacity for strength improvement. Having squared up this point let us now get down to the actual means of increasing size and power. Let us consider the best upper body exercise for putting power into the arms, chest and shoulders – The Supine Press. It is without a doubt the foremost heavy power movement of all, excepting the Deep Knee Bend, and taken together they constitute a body building course by themselves. 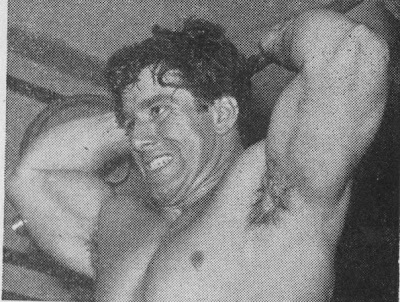 It is in the supine or back-lying position that you can handle the topmost poundage with the arms, and it is also an impressive lift to the innocent bystander when you complete, say, 200 to 300 pounds with your arms (after they have felt the weight by trying to raise it from the floor). 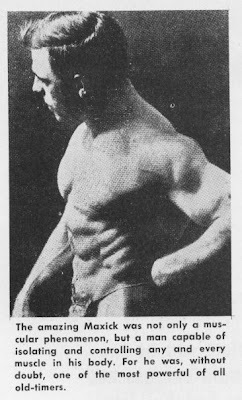 Record poundages of up to 400 pounds have been made on this lift which was a favorite of the old-timers who, indeed, only used movements for power and never dreamt of wasting time on light sectional training. Even those who cannot standing press much more than 100 pounds will be able to push up 150 to 200 in no time at all, and with regular training on the lift you will get up a good deal more. The Arch Back Press is the strongest pressing position (the more so if you have done plenty of parallel bar dipping) though, in recent contest and regulation competition ruling, this position is disallowed, only pressing being permitted with the back to the floor. For power and body building purposes, however, you must practice the arch back method as well, as in all exercises you should include training in the position that allows the very heaviest weights to be used. It would be foolish not to take advantage of every favorable leverage position and device systematically to apply full stress to the muscle ligaments and tendons. As in heavy training on the Standing Barbell Press, for example, you press the heaviest weight you can, concluding the final two or three reps by a pushaway or lean-back press. You also Jerk more than you can press and resist the weight down to accustom the muscles to higher poundage. Before commencing your Supine Pressing you may find it advisable to perform a few floor dips or press ups to warm up. 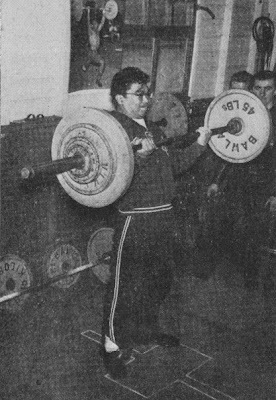 Now, load up the bar to your topmost standing press poundage (you may lower it somewhat if required, or, on the other hand you may be able to handle slightly higher) and get under the bar, on the floor, of course, and grasping it a little more than shoulder width apart, press it several times. Now keep on increasing the poundage in tens and pressing as many reps as you can for each set until you reach your “topmost” press or single limit lift. You will observe the quotation marks in the last sentence which are used because what you think is your topmost press is not that by a long way, unless you have already specialized in Supine Pressing in the manner described herein. As you put up the weight to your so-called limit, widen the arms somewhat, though not too much at a time, and you will find that up goes the heavier weight each time, until finally you are pressing with the hands completely touching the inside collars of the bar. Don’t forget, only widen the arms as much as is absolutely necessary to press up each weight increase, remembering that each little bit wider makes a greater weight go up easier. In case you get the idea that this is now your limit, let me advise you once more to the contrary because we have another very potent device up our sleeves which is, as previously mentioned, the arch back press. So commence arching the back as the weight gets still heavier, until you are right back on your neck, so to speak – the shoulders are firmly to the ground, of course – and press slightly away from you, that is, toward the feet. Employing the two methods concurrently you will get up to a present limit press which is considerably higher than you could have achieved otherwise. A third means of increasing your poundage is to take in a good full breath before pressing and hold it until the lift is almost complete – exhale and release the breath at the hardest point of the bar’s ascent. Now drop down by thirty pounds or so – the actual amount depends on you – and press for 2 or 3 sets of 10 reps. Each workout should find you using a higher poundage for these 10 reps sets, consequent to putting up the initial limit weights. Another word of advice in using heavy poundages. You will probably experience some difficulty in getting the heavy weights into pressing position. I think that the best way is to roll the bar up on to the stomach, then, by arching upwards with the trunk, lift the bar up into the position so that it is supported by the arms only, with the elbows to the ground. Bring the abdomen into play again when lowering the bar. By the way, I must again emphasize – do not go wider with the grip than is absolutely necessary to press the weight. Save the extra widening for those greater poundages. On your 3 sets of 10 keep the grip uniform throughout at a little over shoulder width apart. Train on the Supine Press in this manner for a period of three to four weeks putting up the poundage all the time. You’ll astound yourself.